If you like fun socks that are sure to make you smile when you put them on. Then you are going to love Woven Pear socks. 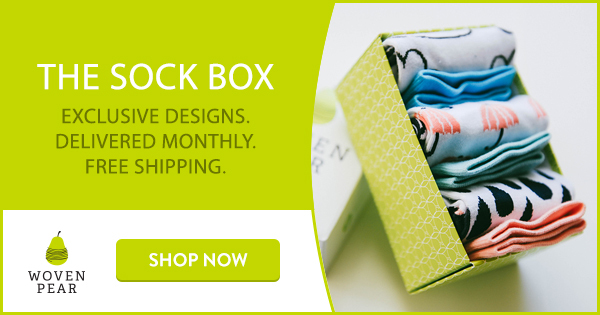 You can buy them one pair at a time, a few at a time… or you can join the Sock Box subscription service and they get shipped right to you as a fun surprise each month. You can pick one month, 6 months or 12 months. The longer you order the better the price. Did I mention that their site offers FREE SHIPPING on orders shipped within the USA. These would make a great gift to someone, then every time they put them on they would think of you. So what did I think? I have worn them and washed them 3 times, they have kept their bold color, very light pilling, still have great stretch. I did not notice any shrinking, they stayed true to size. Not to thick, but not to thin… perfect for all weather types. I did put mine in the dryer, but care instructions say to lay them flat to dry. I was given these socks so I could review them, but all opinions are my own. What did the Fox Say?! Are there tall and short? do they have men’s socks too? My 1eth year old would love this. Didn’t get my way tantrums are the best!! I need those fox socks. Will they get here by Valentine’s if I order today? Will there be a giveaway? I have gout, socks are a must! These are cute!! What a great gift. Ever heard of Woven Pear…. they have pretty awesome socks, that ship right to you.